The UK’s leading traffic sign design software comes with built-in state-of-the-art structural design and doesn’t need an expensive CAD system. 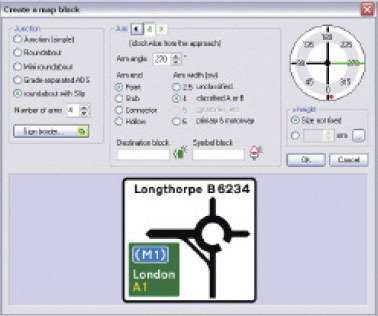 SignPlot is the only system to fully automate the layout and spacing rules of the Traffic Signs Regulations and Traffic Signs Manual. It covers all the signs introduced in the 2016 TSRGD, such as those for temporary lane closures, ‘tiger tails’ and lane bifurcations, and the new options for parking plates. SignPlot has an amazing tool that automates pretty well everything about direction signs: destinations, mileages, panels, patches, symbols, arrows, route numbers and any regulatory or warning signs shown on them. SignPlot makes sign design quick, accurate, colourful and economical for both new and experienced designers. Automatic selection of correct alphabet, panels, patches, symbols, etc. DfT design standards have brought consistency to the presentation of information on road signs, but have also made the design task challenging for anyone unfamiliar with the complex layout and spacing rules. The automation that SignPlot provides enables easy construction of everything from the simplest flag-type, to the most complex gantry-mounted lane indication sign. It helps avoid sign layout errors, whilst minimising design time. Software training costs are reduced and productivity is improved. SignPlot displays a message if it spots a potential mistake and offers to correct the problem. 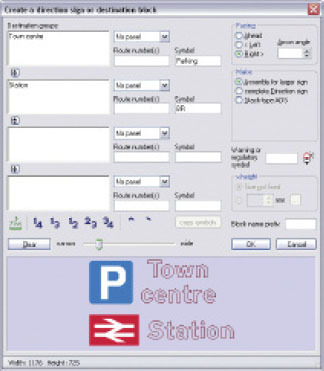 SignPlot is supplied with library files containing accurate symbols and signs that scale automatically to the correct size for use on direction signs and parking plates. These are updated regularly generally in advance of new symbols being published by the DfT or Transport Scotland, as SignPlot is used by them to produce official documents. SignPlot can be supplied with your logo and any tourist, public transport or other symbols specific to your area, or you can import your own bitmap images for use on signs. SignPlot permits signs to be designed in any order. Start with the text, or start with the road layout or symbols – the choice is yours. As well as making sign creation quick and flexible, SignPlot really excels when changes are needed. If a junction type, route number, destination or even the size of the lettering is changed, SignPlot automatically rebuilds affected signs, incorporating the destinations and symbols of the original, and applying the relevant spacing rules. Distances are aligned, character and word spacing is automatic, and panels or symbols can be added with only a basic knowledge of how a sign should look, so you only rarely need to know about ‘stroke widths’. For more advance use, graphical drag and drop editing allows any sign element to be quickly repositioned. SignPlot includes character and symbol outlines accurate enough for digital printing of the finished sign face, or for computer cutting of the reflective material or overlay film. It provides for mounting and manufacturing margins, colour bleed and cutlines to be added. SignPlot’s EPS outlput can be tailored to the requirements of the receiving system and the CMYK values of each colour can be changed. An economical and passively safe sign structure may be designed in the software, using a built-in copy of what is by far the UK’s leading system for designing traffic signs supports. SignLoad covers conventional and proprietary posts, four different types of foundation and (with an optional module) channel section spacing. It leads the way in implementing the most recent revisions of BS EN 12899-1, the passive safety standard BS EN 12767, and the wind loading code BS EN 1991-1-4, and contains comprehensive data from all leading suppliers of supports and other sign components. It is certified for CE marking of traffic signs, which became compulsory in 2013. SignLoad, the structural design module built into SignPlot, is descibed in more detail on its own page. A typical sign requires only a few kilobytes of disk space, so that many thousands may be stored on the smallest of computers, and complete schemes may be easily emailed. This eliminates the need to archive old drawings, providing easy access to every sign in an authority. SignPlot’s search facility allows you to quickly find signs that contain a particular word or symbol. SignPlot is one element of the UK’s most comprehensive range of traffic signing systems. It links to SignMap for planning signing schemes and recording inventory information. The link with ParkMap, the leading system for making and managing traffic orders, enables parking signs to be produced automatically and displayed on the map. SignPlot will export to the Windows clipboard and to many popular file formats, for use with CAD, GIS, BIM, publishing and sign manufacturing systems. It can import bitmap graphic files for use on signs or on drawing frames. Accurate colour or outline sign representations to any Windows-compatible printer, plotter or cutter with optional dimensions, scale, support and foundations details, etc. Buchanan Computing provides a highly praised support and maintenance service for all its systems. Immediate access to knowledgeable staff ensures that any problem is quickly resolved. Regular updates include both software enhancements and the timely provision of additional symbols and changes needed to meet new national standards. User group meetings and training courses are arranged at venues across the UK. SignPlot users are represented on the DfT Traffic Signs Technical Working Party and the Transport Scotland Traffic Signs Working Group, and are kept fully informed of national developments. SignPlot 3 runs on any Windows PC (new or old) and does not need CAD or any other software. It will drive Windows printers and plotters, and other devices, allowing computer-aided manufacture of full-sized traffic signs from the accurate SignPlot graphics. It can be installed on individual computers, on a network for many people to share, or it can be hosted on our servers for you to access over the Internet.